Hockey sense is the most elusive skill to learn and teach. Many people hold the false belief that players either have hockey sense or they don’t. These are the people that will tell you that Wayne Gretzky was just born to be great and he had a natural gift to see the ice like no one else could. I think this is bull. I have read Wayne Gretky’s autobiography and I would argue that his hockey sense came from an obsession for every minor detail of the game, it came from spending every free hour he had playing hockey before school and after school on his outdoor rink (during the winter) and with multiple hockey teams. It also came from sitting in front of the t.v and following plays that the pro’s were making and trying to figure out where they were going, what they were doing, and why. Gretzky (and many other players) learned to be great, and so can you! Influence – You can influence plays with or without the puck, your position, actions, and amount of pressure will influence the opponents next move. In short, hockey sense means being one step ahead of the play. It’s about going to where the puck will be, and reading where your team mates and opponents will be. Now that we have a better understanding of hockey sense, lets learn how we can develop it. Read the coaches feedback below for more on all of the topics I mentioned above. Playing “smart hockey” can mean a lot of things. In my opinion, it can be broken down into three main areas; understanding your individual style, positional vs tactical play, and learning the patterns of the game. Being a smart player starts with understanding your own strengths and weaknesses, then structuring your style of play around those. For example, I’m a fast player, and a good playmaker. I’m an okay stickhandler, but it’s not my forte. So, if I get the puck I’m not going to try to dangle through everyone… I’m going to drive wide with speed, and either cut to the net hard, or look to pull the defenseman deep, then find an open player filling that lane. Knowing my strengths and weaknesses also helps me understand which types of players make good line mates for me. Typically, my favorite type of line mate is one who has nice hands, good finish around the net, and is a little slower than me. Playing with guys who fit this profile are great for me, because I can be the set-up man, and they have the hands and the scoring touch to convert. I talk about this one a lot. It’s not that hard to understand proper positioning… just memorize the X’s and O’s how ever your coach wants you to set up. However, there’s a BIG difference between being in the proper position at the right time, and doing the right thing, while in the proper position at the right time. This is where tactical hockey comes into play. For example, in our team’s defensive zone coverage, we have our weak side defenseman cover the player on the back door. Standing next to a guy on the back door is an okay start… and that’s the proper position… but what’s more important is that he neutralize the back door man’s stick. If he doesn’t neutralize his stick, then that player is still a scoring threat. Other examples of tactical play could be force vs contain, gap control, shot selection, etc. Players who DO the right thing, while in the right position at the right time are much more effective! Hockey is a game of recurring patterns. Players who can recognize these patterns quickly, and react properly, operate at a much faster pace than players who don’t. For example, a defenseman breaking out of the zone sees similar forechecking pressure every time. Either the pressure will be hard on his inside shoulder, in which case he can execute a quick turn-back (or misdirection) and come out the strong side; or the pressure could be directly behind him, in which case he will skate it behind the net, cut tight, and hang the forechecker up on the net; if the pressure is inside out, a D to D pass behind the net is a great option. This idea of recognizing recurring patterns can be applied to many different areas of the game such as offensive attack options, regroups, power play and penalty kill, etc. So, how do you actually implement these concepts into your own game? Start by analyzing your own game. How would you describe your style? Some descriptive words could be speed, finesse, gritty, tough, smooth, hands, defensive. What would you say your typical role is on your teams? Some possible roles could be goal scorer, playmaker, digger, enforcer, stabilizer, spark plug. What type of player do you play best with? Describe him or her. Now that you understand your strengths and weaknesses, focus on playing to your strengths, and developing your weaknesses to the point where they don’t hinder your strengths. Remember I said speed was my main thing, but stickhandling wasn’t? Well, my stickhandling is still good enough that it doesn’t hinder my ability to skate full speed with the puck. That’s what you need to do to get the most out of your game. Next, sit down with your team’s playbook, and learn where your coach wants you to be in every possible situation. If your team doesn’t have a playbook, check out our free Coaches’ Training Course that covers positional play for many different game situations: http://weisstechhockey.com/blog/coaches-training-course/ Learn your position, and learn the tactical expectations in each scenario, then practice it! Here’s another quick tip: Once you’ve got your own position nailed down, learn another position. There’s nothing more useful to a coach than a “utility player” who can bounce back and forth to different positions depending on the needs of the team! Lastly, start watching game film, both of your own games, as well as the NHL games. Watch for the positional situations your coach has taught you. Watch for the recurring patterns that happen over and over. Watch for the times when you made the right decision, and watch for the times when you messed up. Think about how you’ll fix your mistakes. Watch how the pros play certain situations. See if you can see any of your teams’ systems being used by the NHL teams. In short… BECOME A STUDENT OF THE GAME. Players who study the game away from the rink make better decisions come game time, because they’ve rehearsed their actions over and over in their minds. They already know what they’ll do when a certain situation presents itself. Instead of reading and reacting, the top players are constantly recognizing and reacting. Coach Nielsen has been coaching hockey at all levels for the past 27 years. He currently coaches a Midget 16 AAA team. Coach nielsen describes the importants of playing smart hockey and discusses a few smart plays that he likes to see. Coach Nielsen is responding to an email and I mentioned teaching players to beat the defense with their speed rather than a deke. You already mentioned one that I tell my players all the time and that is to use your speed and stay outside instead of always trying to go between defenders legs. Too many players try that same move over and over and don’t realize how much better it is to go hard to the outside and open up the ice for your teammates. Every season if I can get just one of my players to change their game away from that deke to a hard outside rush I feel like I accomplished something. Another one I drill into their heads is on the penalty kill. Too many players are trying to score a shorthanded goal instead of just trying to prevent one against us. I tell my players to concentrate on clearing the zone first and don’t blow the zone defensively until the puck is out of the defensive zone. Too often a five on four becomes a five on three because a player blows the zone looking for the breakaway pass instead of playing his position. Don’t be afraid to change out of the offensive zone. Too many players want to play when the puck is in the offensive zone and then are too tired to backcheck and cause the team to play against odd man rushes. I work on my guys to understand how long a shift should be and when they should exit the ice no matter what area of the ice they are in. Don’t be shy; make sure you talk on the ice. All players need to talk while on the ice. Goaltenders need to let defenseman know what’s happening. Forwards need to talk to the defensemen when looking for a pass breaking out of the zone. Defensemen need to talk to each other and the forwards to know who to pick up on the zone entries by the opponent. Too many players are too quiet and don’t let their teammates know what’s going on behind them and around them. Play without the puck. A good player understands open ice concepts and passing lanes. Don’t stand still when you don’t have the puck. Keep your feet moving and look for open areas on the ice where your teammate can get you the puck. Be aware of the passing lanes that your teammate needs to use to get you the puck. Don’t stand behind a defender and think you are going to get the puck. Move to open ice and keep moving until you find the right spot to receive a pass. I hope these few items help you out and please feel free to contact me any time. Thanks for the opportunity to let me contribute in some small way. Really like your site, keep up the great work. 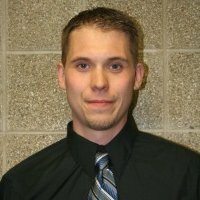 Kevin is the founder of HockeyShare.com and has been involved in coaching since 2002. He is currently coaching for the Milwaukee Jr. Admirals AAA at the midget and bantam levels. Defense: on the offensive blue line, a D can continually ask him/herself “how many opposing players are in front of me?”. This simple question / process allows the player to determine if someone is or may be behind them. Defense: when your partner has full control of the puck, the simple question to ask yourself is: “am I in a good support position?”. If you ask this, a player can determine if 1) he/she is a viable support pass option 2) he/she is a proper “safety valve” if the partner makes a mistake. Forwards: in the offensive zone ask the simple question: “do we have a third man high?”. This will prevent wandering toward the puck without a purpose. Forwards: in the offensive zone ask the simple question: “am I an option?“. This will help players understand the difference between “being open” and simply “being unguarded”. If you’re “open”, you can receive a pass. If you’re “unguarded”, it just means nobody is around you, but it does NOT mean you’re an option. Note: These thought processes will eventually become second nature. To help yourself think like this on the ice you can copy this article to your phone and read them before you play to remind yourself. How can a coach train players to be smarter on the ice? : I believe this is a two-part process. The first part is to put players into specific game situations during practice. This begins with a very specific execution of a skill, sometimes un-defended so players can develop technical proficiency in the skill set. Next, move to a pressured version of the situation. Next, add another option to the same situation and practice it with and without pressure. The final step here is to then run the same game situation and allow players to decide which of the skills you’ve taught to execute in particular situations. Give them immediate feedback good or bad on their decisions. The second, and perhaps most important part, is to be sure you are telling the players WHY you are executing specific options in different situations. When players understand why they’re doing something, they develop a deeper understanding of the situation overall, which gives them a greater ability to make the correct decision next time through. What small mental tips will help hockey players become more effective on the ice? : The best mental tip I ever received as a player was to visualize situations before the game. Picture yourself executing very specific scenarios in your head and succeeding. Another tip is to pay close attention to the next game you watch on TV. Watch the pros execute (and make mistakes) at a high level, and focus on specific parts of the game that you’re learning in practice. If you’re a D who is struggling to make a clean first breakout pass, watch some of the top athletes execute it time and time again, and see if you can pick up one or two things you can apply to your game. Note: With the NHL highlight center you can easily watch and re-watch highlight videos and study the pro’s! Kevin runs Hockey Share, a great hockey resource with lots of great hockey articles, videos and drills. Hockey is a fast and fluid game but many of the same situations happen over and over in a predictable way. (For instance if you’re a forward on a 3-on-2 then the middle guy will most likely drive to the net and weak side winger will move high.) If you’re a D on the pp, you have more time then you think. A forward on the pp getting pressured hard along the wall can reverse it and know that his weakside D will be there. Don’t just play . Pay attention to the details of the game. Really practice your skating and stickhandling skills on your own time. You have a certain mental capacity. If you can only stickhandle at 80% or can’t cross over to you’re left then you’re concentrating on completing these skills when pushed outside of you’re comfort zone instead of being aware of you’re on-ice situation.Think about it from a different perspective. If Steve Nash was focusing on dribbling then he wouldn’t be able to make those amazing passes. Brett came very close to playing in the NHL and has since written 7 pre-game habits of pro hockey players. The book helps player prepare themselves mentally for games. Darryl runs a hockey development center in St. Catherines Ontario. His training focuses on the three speeds of hockey: speed of mind, speed of hand and speed of foot. 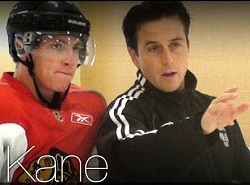 He has worked with NHL players such as Patrick Kane, John Tavares, Matt Duchene and many more. Hockey sense is long mis-characterized as a skill set that can’t be influenced. The rhetoric is you either have it or you don’t. While it is true that reading and anticipating the game at a high level comes easier to some than others. To say that it can’t be influenced or dramatically improved is just not true. Most of hockey anticipation comes from pattern recognition. In every game, whether it is peewee or the NHL, there are certain patterns that occur, understanding and learning to recognize these basic patterns is a very powerful influencer of one’s hockey sense. Take triangles for example the entire game is played in triangles, so if you can recognize when you are in a triangle and how it rotates you will always be in great puck support. Don’t let anyone tell you that hockey sense can’t be influenced because I do it every day. Visit Pro Playmakers to learn more about Darryl and see videos of him working with some NHL players. Some hockey players are naturally more gifted than others, however this does not mean you can not improve your hockey sense. Improving your hockey sense starts with understanding the game and understanding the naturally re-occurring patterns. Hockey sense comes from predicting where the other team will move the puck, and where your players will be moving while your team (or you) has the puck. As a player, you should also maintain a good position on the ice so that your players will know where you will be! In order to begin predicting where players will be you should have a good understanding of basic hockey positions. Knowing basic hockey positions and plays will help shave time off your decision making and allow you to make quicker and smarter plays. If you are looking for information on positions you can read my article on the role of a winger and the role of a centermen. I also have an article on 5 breakouts every hockey player should know. If you are looking for more detailed information on hockey systems I strongly recommend Hockey plays and strategies (Amazon.ca link for Canadians), I have been reading this book for a while and have found a lot of great information in it. A great way to hone your hockey sense at home is to work that pause button! If you visit the NHL video center you can find highlights from every game for the entire season. You can watch as many as you like and each segment is about 6 minutes long. While watching the highlights hit the pause button before each player makes a decision. This allows you to quickly read the play and make a decision, now hit play and see if you made the same decision as the pro player. 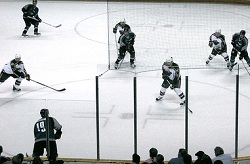 You can also pause the clip and notice where each player is on the ice. Look for good decisions and mistakes (remember even pro’s mess up). 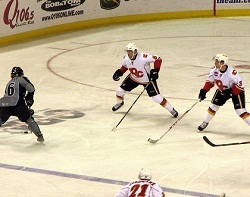 While watching the highlights also look for smart plays or moves that the players are using and try to incorporate them into your game, you will notice small things like protecting the puck in certain areas, effective methods for battling for the puck on the boards, when to run a delay, etc. You can use all of these simple and effective moves to become a smarter hockey player and improve your hockey sense. If you liked this article you can subscribe to our blog with the box below, and share on Facebook or Twitter (buttons provided below). Thanks for reading! Hey jermey i love your videos and aricles. I constantly tell my friend how you really helped me in my development. I started hockey a bit late (14 almost 15) and all m friends and even my dad questioned why i would bother since I’d never play any where near the level of the kids around me. It was hard to practice skating since we don’t get frozen ponds down in florida, but i made use of all the icetime i could. I watched all of the videos i could on your channel and practice shooting and puck handling all the time. I had to ontinually change shooting spots becuase my shots were getting harder and harder as time went on(i broke some stuff 🙁 but i paid for it) I just turned 16 and im playing high school hockey and couldn’t be any happier. Thank you for your work in putting out these videos and articles. I don’t think i would have made it this far without them. That’s Amazing Tyler! Thanks for your comment. You and people like you who love hockey but don’t have access to good coaches is the reason I started How To Hockey. Keep on practicing and having fun! Just a quick note to say thank you & keep up the great work man! Thank you Jeremy! Your site is awesome and just what I’ve been searching for. GREAT articles, clearly a lot of effort has gone into them. It is appreciated! Hi Jeremy, great ariticle to really help me think about things while on the ice. Concerning hockey roles, while a scorer, playmaker, digger and enforcer are pretty self explanitory, what are stabilizers and spark plugs? Are there more hockey roles other than the ones listed in this article? Thanks! There are quite a few rolls that one player can play on the ice, some guys only need to play one roll, others will play a number of rolls. Jeremy Weiss wrote that particular part of the article. A would assume a spark plug is someone who gets the team fired up, maybe with a fight, big hit, or some gritty high intensity play. A stabilizer would be more of a Nick Lidstrom type of player, a leader who is cool headed and keeps the team calm when they need to be. Great article as usual. Very informative. One of the things I love about hockey is that it really is mentally challenging. The angles, patterns, anticipation… Of course, scoring a goal is about the best reward there is in sports. Can’t wait to improve in the areas mentioned in this article. Excellent article. Really shows how to sculpt the minds of young players, e.g. This will help my sons game. Thanks. LOVE this article! I’ve read/watched many hockey tips and drills from all the people interviewed (and of course from howtohockey.com) and it’s helped me so much to get better in my first two years of playing hockey as an adult. It’s nice seeing all of them grouped together here in one article. In particular, I watch the M2Hockey/Hockey Share YouTube channel religiously. Kevin is a great skater and love trying out his drills!